Is There Such a Thing as a Leading Arm Suspension? Author: Subject: Is There Such a Thing as a Leading Arm Suspension? It dawned on me today that the rear suspension arms on the F27 are on the opposite side of the axle than on every other live-axle set-up that I've seen (they're connected to the chassis at the rear-most end of the vehicle). Can anyone expand on what the pro's / con's of this set-up would be? System used by Marcos on the Coupe IIRC it has been in use for years. Suspect space may be an issue ?? The F27 was pretty much a copy of the Jeffrey J4 which had the leading arm rear suspension and the inboard rocker arm front suspension. The later Jeffrey JS5 went to 'conventional' trailing arm on the rear axle and outboard inclined coils/shocks at the front. Does it have different handling characteristics to a trailing arm (I haven't actually driven the F27 in anger). We ran a rear suspension set up on our championship winning TR7 V8 where the upper arms were "leading" and were pivoted in specially constructed turrets in the boot floor. They were parallel to each other and parallel to the floor if viewed from the side. 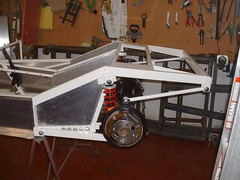 The lower axle location was an "A" frame which picked up the existing pivot points behind the seats and connected to the bottom of the diff casing using a spherical bearing. The handling was sublime and received praise from everyone who drove it. Motoring journo Jeremy Walton said of the car " among the best handling front engined cars I've ever driven". So I suppose that leading arms will work fine if the geometry is correct. That pretty well describes the Live Axle Caterham setup. Forward facing Leading arms would require serious structure behind the axle line. Not always readily available. It has always struck me that F27 rear set-up had more than adequate structure rear of the axle line to cope with the leading links. I haven't driven other Se7en type cars in anger but the F27 always seemed pretty planted and that was before I fitted Protechs courtesy of Matt at Procomp. The only other comment was from an instructor on a driving day who took it out by himself and after more laps than I'd anticipated came back grinning broadly, asking "Does it ever understeer?". Answer was "yes but only in the wet!" Bounce. The f27 chassis is a weighty heffa compared to that of Ron champion but seems to work very well, nobody complains about Honda engines running backwards to provent torque steer this being the same sideways principle to a similar problem. The fury has 2 leading to trailing arms and manages to do it with a light weight chassis. I beleive the system as fitted to the Fury aids traction because the axle twist under acceleration causes the rear of the car to try to rise which is obviously resisted by the mass of the vehicle and therefore will aid traction. The problem with doing this with leading or trailing links tilted up is the rear steering effect. LocostBuilders » Forum » Running Gear » Is There Such a Thing as a Leading Arm Suspension?